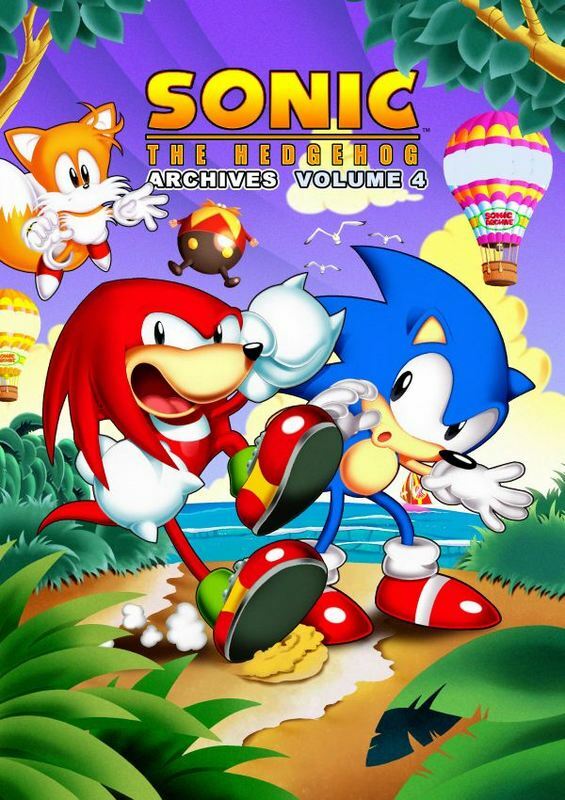 The first appearance of Knuckles the Echidna is the big draw to this volume of the Archive. In terms of a comic book adaptation of Sonic the Hedgehog 3, or any video game for that matter, Archie did a good job capturing the world of the game and bringing it into the pen and paper world. While still on the lighter side, Volume 4 is the beginning of recurring plot devices, a grander story, and themes that will come back up again and again in future issues. 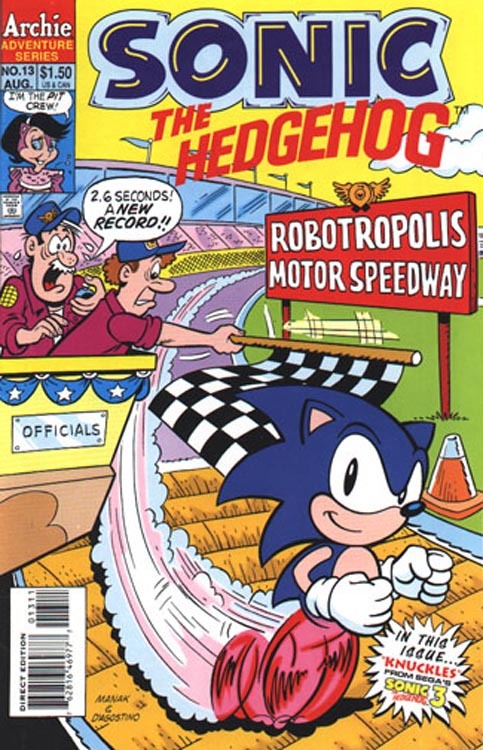 The comic book adaptation of Sega’s video game Sonic the Hedgehog 3. When Sonic and Tails discover the mysterious Floating Island above Mobius, they naturally decide to investigate. But the island’s guardian, a red haired echidna with a temper problem has a different plan. The Freedom Fighters learn of Robotnik’s newest invention, a gigantic space ship! Sally, Sonic, and the rest of the gang head into space on Robotnik’s own contraption, only to find the big bad guy setting them up for an ambush resulting in a crash landing on a distant moon. But the battle escalates from there, and things don’t look good for the good guys! – Taken directly from Sonic 3 are the fire-spitting machine that destroys the forest in the beginning of the game, the underwater level features where Sonic hangs on to a bar and is blasted through the water, as well as Knuckles gliding on a few occasions. 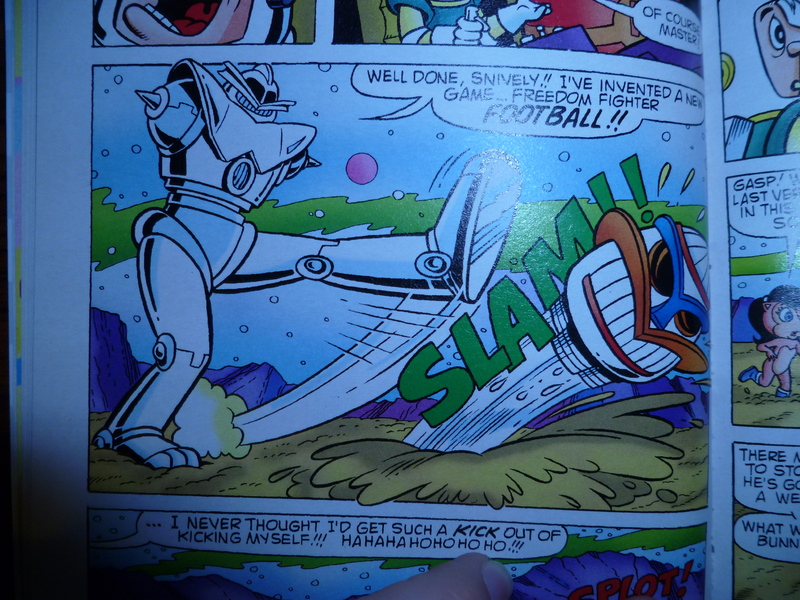 Robotnik deduces that separating the Freedom Fighters is the best way to dispose of them. So the evil doctor builds a shopping mall to allure Princess Sally and Bunnie Rabbot. 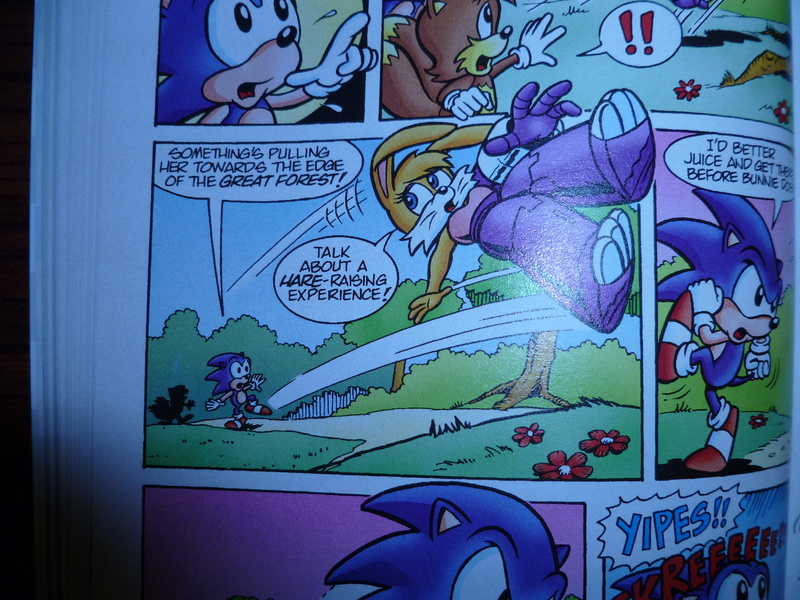 But when they get there and get ambushed by a group of SWAT Bots, Robotnik is in over his head, big time. 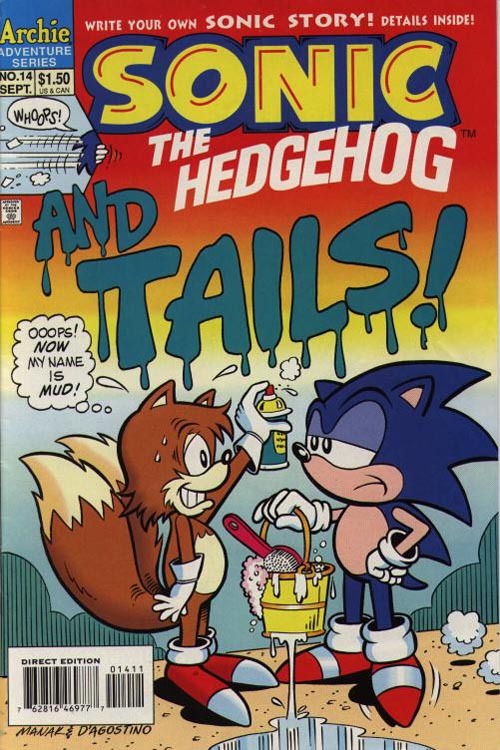 – There is a “Do It Yourself Sonic” section of the issue, where all the word bubbles were left blank and readers were asked to come up with dialogue for each scene and send them into Archie. The winners actually appear in a later edition of Sonic Archives. Sonic is running through the rain drops (literally!) when he hears a trapped frog calling out for help. After rescuing the distressed reptile, Sonic is given three magical stones that each give Sonic a special power for a short time. Skeptical of the truthfulness of these stones, Sonic passes them off as phony. 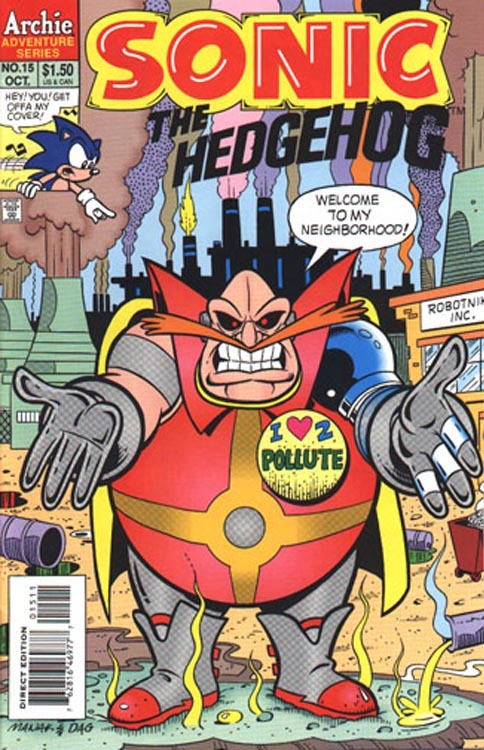 That is until he must rely on their powers to help him against Robotnik. Robotnik builds a gigantic magnet to attract Bunnie’s metal body parts in order to complete her roboticization process. – The magical stones Sonic is given are the first traditional magic items seen in the series. Sonic and the Freedom Fighters have apparently defeated Robotnik, as there hasn’t been any sighting of him for six months. Now, at Sonic and Sally’s wedding, the Freedom Fighters begin to realize that everything isn’t as it seems. 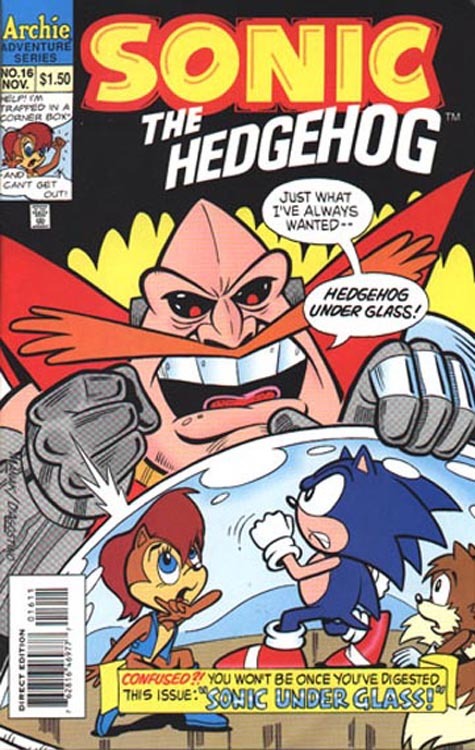 Before long the team discovers they’ve been duped by Robotnik and have been miniaturized and kept under a glass bowl all this time! Robotniks comes to the conclusion that there must be a mole in his group of robots because Sonic always seems to foil his plans. 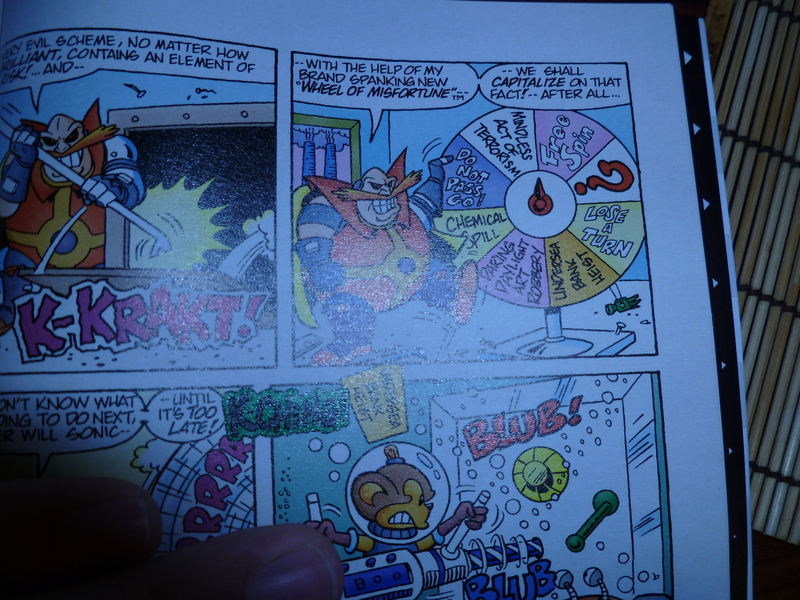 To get around this little issue, Robotnik uses the “Wheel of Misfortune” to randomly choose which dastardly act he will commit next, in hopes of himself not knowing what he’s going to do will in turn throw of Sonic and the Freedom Fighters. The biggest draw this volume has is the first appearance of Knuckles. Sonic’s rival will become a huge player later on in the series, and will actually get his own spin-off series in time. Another faithful adaptation of a video game story also does the volume good, as well as the other stories told throughout. While not as strong a presentation as Volume 3, Volume 4 is still a good collection of issues that give us a lot to look forward too, not the least of which being more Uncle Chuck, Muttski, and of course Knuckles!